​create unique and personal works of art since 1998. We are located in Landsdowne Shoppes on Tates Creek Rd. in Lexington. 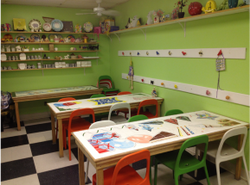 Painting Pottery, Fusing Glass, Summer Camps and Classes. connect with us on Facebook and YouTube! We hope you'll come paint with us soon! Individuals are welcome to bring food to eat while they paint. However, groups wishing to serve food MUST make arrangements to use the party room. No serving platters may be used in the Main Studio area. We are excited to announce that we are now offering online booking for our Classes, and Summer Camps!!! Check out our calendar and get booking now!